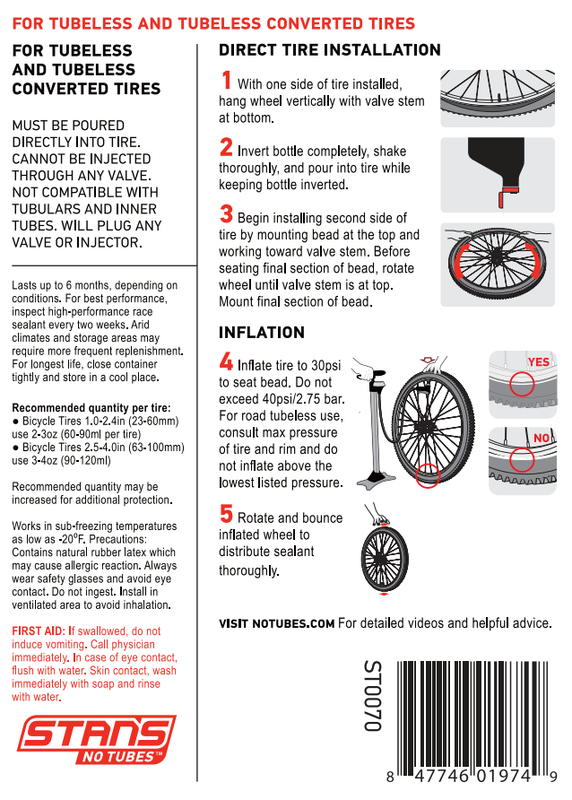 Stan's Race Sealant, the next evolution of their legendary tubeless tire sealant, has been formulated through obsessive tinkering over the past 15 years. Developed in demanding racing conditions with the input of professional racers and mechanics, Stan's Race Sealant quickly seals large punctures that other sealants can't, allowing elite athletes and dedicated riders to do what they do best, uninterrupted with unnecessary flat fixes. The Race formula starts with the same basic components of Stan's traditional latex-based tubeless sealant, but is enhanced with a greater number of sealing crystals, with the addition of special "XL" crystals. This formula not only seals punctures quickly and effectively, it creates a lattice which strengthens and reinforces the damaged tire to create a permanent seal. Race Sealant, composed of natural materials, is non-toxic, non-corrosive, and designed to operate in temperatures down to -30°F. Due to its enhanced sealing properties, Stan's Race Sealant can only be installed directly into the tire. This sealant will quickly clog injectors and valves during installation, and is not recommended for use with tubes or tubular tires. Stan's Race Sealant is made in the U.S.A., and is available in quart (32 oz) size only.